There are so many things that you are going to have to do when you are on the road. Not all vehicles are equipped to handle all of the different aspects of driving adequately. The new Rogue Sport is one of the vehicles that our Nissan sales professionals praise for its ability to handle driving. 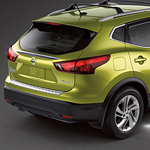 One of the features of the Nissan SUV is that it has the intelligent trace control. This particular feature is for cornering. The challenging ramps and other parts of the road are no match for what the intelligent trace control feature that adjusts the braking for every one of the wheels. The Rogue Sport SUV also has the available ProPilot Assist which helps you stay in your lane. It also helps you with other aspects of driving so that you can always get to where you need to be in a safe manner.